This past weekend, at dinner with friends, some random course of conversation brought up a crazy story that I told the group. It was something I hadn’t thought about for a while, but they loved the story and urged me–repeatedly–to write more about stories like it. It’ll have be another time that I tell you about the round-trip flight from Seattle to London for just one night. But it did remind me that I have racked up some interesting, unusual experiences over the years. Many of which happened a long time ago, which makes me hesitant. Shouldn’t I be focusing on more recent experiences, the resulting stories more interesting and relevant in their timeliness? Maybe. But perhaps those friends are right. So here it goes, one random slice of my past that has, in its own way, a small dose or two of timeliness. I saw a tweet yesterday about the legendary French chef Paul Bocuse being given a major award by the Culinary Institute of America. Last night, the venerable school conferred on him the Chef of the Century award. Hearing that news, immediately I was distracted by memories of the day I met Monsieur Bocuse. It was 1991 (see? I told you some of my best stories are pretty old…. which means I am too), the Wednesday before Thanksgiving. In a mere few weeks I’d be leaving France after nearly 2 1/2 years of living and working at La Varenne cooking school. I’d officially graduated with the Grand Diplôme in the summer of 1990 but stayed on, both helping with programming for the school and working on cookbook projects with Anne Willan. A truly magical and life-changing time it had been. But all good things must come to an end and by late 1991 I was truly and honestly ready to leave France, ready to return to my Seattle home, my family, my then-boyfriend-now-husband, and whatever my future was to become. Ready as I was, building up to leaving took some work. I had to emotionally prepare myself for drawing this amazing chunk of my life to a close. Which included a few very memorable parting meals to be sure. Anne and her husband very generously took me and a fellow La Varenner to Les Crayères in the Champagne region for dinner and we were treated to some truffle treasures I shall never forget. And then there was the dinner we cooked at the Château du Feÿ [2018 update: the château recently purchased and offering occasional public events and classes once again!] La Varenne’s home in northern Burgundy, the place I had called home for so long. We made amazing meatloaf, some decadent mashed potatoes and splurged on a great bottle of authentic Heinz ketchup to sauce our creations. Meant to be a meal to help the re-entry! And it worked, what a great night that was. The third meal I most remember was on that grey, chilled November day. One friend at the school and I, we made the trek from near Joigny to Saulieu (near Dijon) for a magnificent lunch at the 3-star restaurant La Côte d’Or. Sorry to say I don’t have the menu and don’t recall details of what we ate. Part of that growing-old thing, I suppose. But everything about the experience was wonderful, elegant but comfortable, relaxed, delicious, special. We had a congenial server who added his own personality to the meal. At one point, over my right shoulder, I noticed a rather distinctive face. When the server next returned to our table, I made the slightest motion toward that nearby table and commented on how much the gentleman looked like Paul Bocuse. “Well, that may be because it is Paul Bocuse,” he said with a sly smile. The great chef was dining there with his son, a simple father-and-son lunch in the Bocuse family style! Our server then proceeded to conspire with us a way to meet M. Bocuse. Between courses at some point, he indicated to the chef that two American culinary graduates would love an opportunity to meet him. Cordial hellos and how-nice-to-meet-yous were briefly exchanged. Nice enough. But then comes one of those lovely traditions of fine dining in France. Why continue to sit in those straight-backed chairs at the formal dining table to sip coffee and nibble friandises (those little chocolates and petits fours served after dessert) when you can, instead, retire to the salon where overstuffed chairs and low tables await. 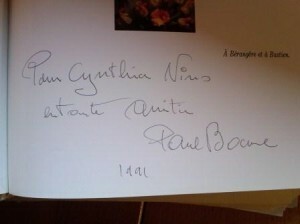 There, we were seated next to Messieurs Paul and Jerome Bocuse. And while we didn’t visit for more than 10 or 15 minutes, it was a chance to talk a bit more about our time in France, and we learned that Jerome was at that time studying at the CIA, home on a break. A dozen or so years later, a great shock to the food world, Bernard Loiseau killed himself. I won’t pretend to understand or interpret what drove the celebrated, beloved chef to such a devastating decision. But my heart’s made extra heavy in recalling M. Loiseau’s death, having just read the news yesterday of a young, talented, creative, dynamic chef here in Seattle who took his life a few days ago. No way to draw dots between the two, their lives and experiences too unique, the intersections of their lives too unlikely. That they were both chefs, in this case, seems pure coincidence. But it’s enough to give me pause, as it does so many others, as we vow to pay keener attention to friends and loved ones, be attentive to despair, be available to dispense hope and plenty of love when most needed. It’s simply heartbreaking to imagine that degree of despair for one human to carry….. But most of all? It makes me want to relish every moment with those I love, cherish the opportunities that come with each day. Cozy time at home with family and friends. Great adventures in life that change our view of things, and sometimes literally change the paths we go down. Embracing moments of serendipity, like noticing the distinctive Gallic features of the man lunching near us on that chilly November day.